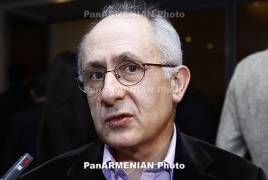 PanARMENIAN.Net - Turkish scholar Taner Akcam has said that he has found the killing orders that led to the Armenian Genocide in the Ottoman Empire in the early 20th century, the historian himself said in an interview with Noted. Akçam’s latest book, "Killing Orders: Talat Pasha’s Telegrams and the Armenian Genocide", released earlier this year, reveals that crucial evidence, long thought to be fraudulent or inaccurate (known to scholars as the Naim-Andonian documents), are in fact authentic. It is, Akçam states, “the smoking gun”. Despite the evidence, despite the “smoking gun”, several countries still refuse to openly recognize the Armenian experience as a genocide. Recognition efforts in the US and the UK have stalled because of close military, economic and diplomatic relations with Turkey. In order to combat these cynical alliances, Akçam compares the campaign for genocide recognition to the global movement against apartheid in South Africa. “[The] South African apartheid regime did not collapse only because of domestic resistance against the government. It was also, partly, the isolation campaign, international solidarity with the opposition in South Africa. I think it should be the same in Turkey. “You should not allow a denialist government to bully around in the international arena – you should really restrict their possibility to act,” he insists. Perhaps no other figure has faced so much denialist ire and vitriol than Akçam, including death threats and defamation. His name appeared on the hit list of Ergenekon, a clandestine Turkish group with military links. They were never idle threats.